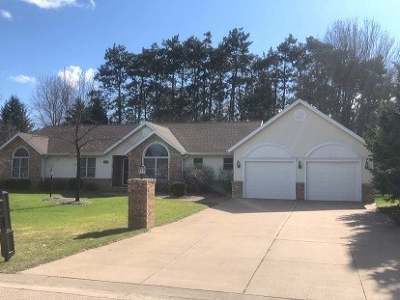 Beautiful, three bedroom home situated in a quiet cul-de-sac neighborhood, in Antigo. Located close to Antigo High School and recreation, this well maintained family home would make a great contender for a growing family! Featuring custom cabinetry in the kitchen, a gas fireplace in the cozy living room, in-ground sprinkler systems throughout the landscaped lot and main level laundry! There is an attached, two car heated and insulated garage, as well as a full size partially finished basement with an office. The main level also features a large master suite with a full bath and large closets for ample storage. Floor to ceiling windows in the living room and formal dining room allow for plenty of natural lighting. In case including all appliances is not convenient enough, the pool table and hot tub are also included in list price! With an abundance of features to offer your family, this may be just the move you have been searching for! Call today to schedule your showing!